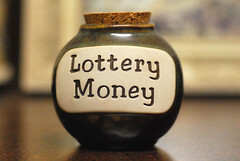 It has been sorta fun watching all the hype surrounding the billion dollar Powerball lottery. Lots of stories about what could be done with that much money (greatly reduced by taxes and other factors), with reporters and others trying to make sense of the odds of winning, too often comparing them to those of being struck by lightning. 1Image by Lisa Brewster on Flickr. Used under a Creative Commons license.However, the best piece in the flood of coverage came from Wired, explaining The Fascinating Math Behind Why You Won’t Win Powerball. Including how the non-profit organization behind Powerball recently changed the format to make it much harder to win the top prize, and easier to win the pocket change prizes. As I’ve previously ranted about, this is the kind of math that should be at the foundation of our K12 school curriculum. Real world, interesting, practical,2Maybe fewer graduates would buy into future lottery hype. Literally. With real money stimulating lots of questions with connections to other areas of study. Instead of sending every student through the school theoretical math tunnel heading straight for Calculus, a subject used by very few adults.